SnitchSeeker's Snape Icon Heroes statue U.S./Canada giveaway rules. Vault 713 (Contest Forum) In the past, this vault housed the precious Philosopher's Stone. Now that the Dark Lord has fallen, the vault and it's contents are open to the public. For a chance to win, dare you enter? SnitchSeeker, in association with Icon Heroes, will be giving away the Severus Snape Half-Blood Prince with Wand Statue to a lucky reader in the U.S. and Canada this week! 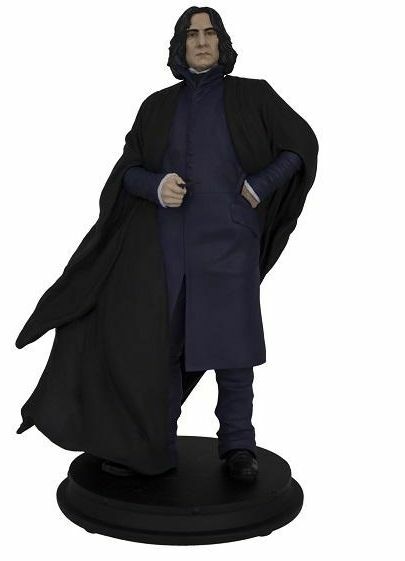 Order the everus Snape Half-Blood Prince with Wand Statue here! Read below on how to participate. The contest is only open to readers in the United States and Canada. We will receive ALL submissions, don't worry. Winners will be chosen at random after the completion of the giveaway. Please submit by February 17, 2019. For subject, hit 'Other' and put #SnapeIconHeroes giveaway. Readers (providing a full name and email address) can participate only. Please abide by the contest rules; failure to do so will lead to disqualification from the contest. Also, please post your contest entry ONCE; repeat entries/comments in the contest thread will also lead to disqualification. The contest will run from now until 11:59 p.m. EST on Sunday, February 17, 2019. If anyone has questions, feel free to ask them here. As per site rules, do not spam this thread with irrelevant comments or posts.